Fly Casino is pleased to release another game into our growing list of games. 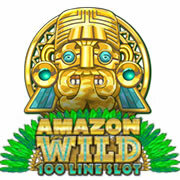 Amazon Wild is an exciting 100 Line game with huge payouts. The bonus allows you to select up to 5 runs in the temple bonus and see what treasure you will find! Also the expanding wilds take wins to the next level! Check out Amazon Wild live at Fly Casino today! Don't miss next week's newsletter, as we will be announcing our most exciting promotion of the year. Santa's Surprise gives a variety of presents based on your days played and is on top of all of our other promotions. Free money, big bonuses, VIP upgrades, and many other exciting rewards will be handed out by Fly Casino's very own Santa. This is a cant miss promotion at Fly Casino.